Insights and Rants: Misleading: Incredible! It seems that Incredible Connection has joined the group of advertisers who are happy to mislead consumers with their "Windows Compatible" adverts. My complaint is that the adverts don't say how much extra you have to pay, or that Windows is not supported on the Mac. In my book (not a MacBook) that is misleading, not to mention bad marketing. The cost of buying Windows on their web site is not cheap either, and if your original PC came with Windows pre-installed then your "Recovery CD" is unlikely to work on a Mac, piracy notwithstanding. 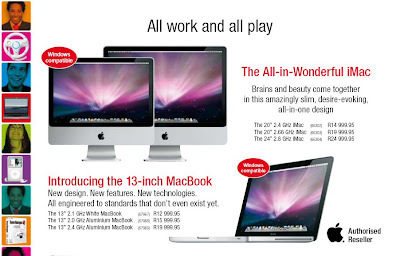 So the "All-in-Wonderful iMac" is not as "all-in" or "wonderful" as it would appear. I guess the "reality distortion field" famously associated with Apple has extended to South Africa. I also tried http://www.zastore.co.za/email_window_enquire.htm but haven't had a reply.